Success is based on innovation, product quality, development competence and flexibility with absolute adherence to deadlines. 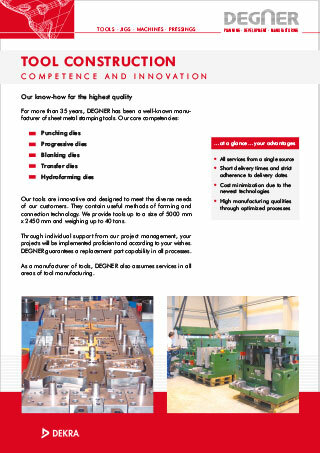 DEGNER has been a renowned manufacturer of pressing tools for sheet metal forming for more than 40 years in various industries. We offer our customers innovative, creative and reliable products. Functionality, quality and precision with absolute adherence to deadlines are our success factor. For our customers, we are a powerful and reliable partner and rely on long-term successful cooperation. Constructive discussions combined with a project management that is oriented towards deadlines and costs create transparency, trust, satisfaction and security. We act flexibly and promptly, thus meeting the short-term needs of our customers. Our qualified employees work in competent teams that contribute creatively and flexibly to the success of our company. Regular education and training as well as workshops and training courses are constantly expanding the know-how of our employees. We train trainees and employ them after they complete their training. Their basic knowledge is very well-founded and broadly diversified. Ideas and impulses lead to continuous improvements! 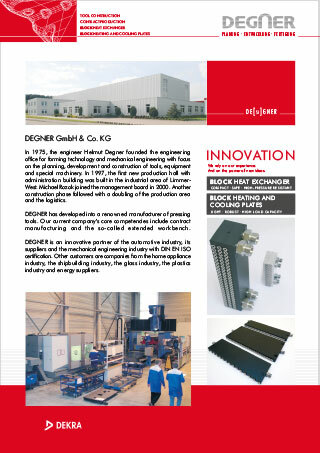 1975 Graduate engineer Helmut Degner founds the Helmut Degner engineering office for forming technology and mechanical engineering. 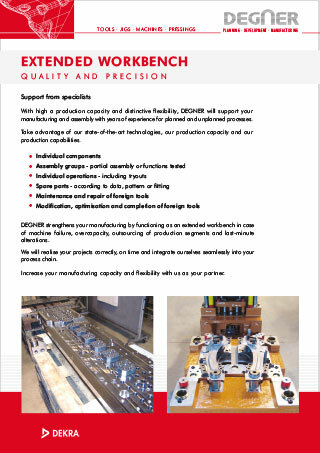 The main focus is on the planning, development and design of tools, fixtures and special machines. 1983 Relocation to new premises (400 m²). Introduction of the CAD system Technovision. 1986 Visit of Walter Hirche, Lower Saxony's Minister of Economics. 1989 Establishment of our own production for the manufacture of tools, devices and special machines. Introduction of the CAD system CATIA. 1992 Development and commissioning of a hydraulic NC press with a pressing force of 1600 kN for testing tools. 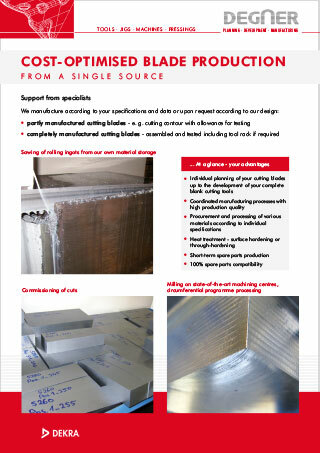 Manufacture of stamped and bent parts in small batch series. Development of a combination machine for shearing, bending and punching. 1993 Presentation of the combination machine at the Hanover Fair. 1997 New building in the industrial area Limmer-West in Alfeld, Germany. A production hall with administration building (1300 m²) is built on a 12000 m² plot of land. 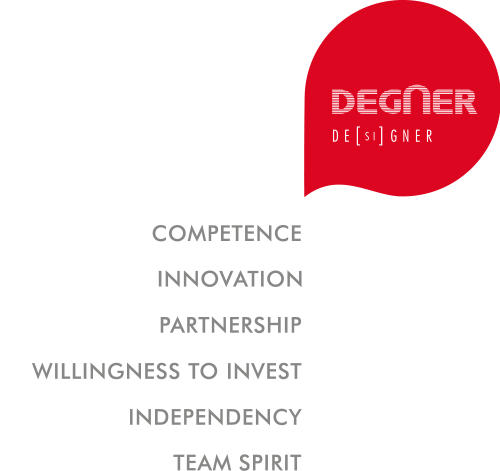 1998 Foundation of DEGNER GmbH & Co. KG. Move into the new company building. Commissioning of a hydraulic press with 10000 kN pressing force for the tryout and the production of pre-series parts and small batch series. Capacity expansion by increasing the machine park. Design and construction of tools up to 2500 mm in length and 10 t in weight. 1999 Design and construction of tools up to 3500 mm in length and 20 t in weight. 2000 Business economist Michael Rozok joins the management board. First-time apprenticeship of a tool mechanic (specialised in stamping and forming technology). 2001 Design and construction of tools up to 4500 mm in length and 30 t in weight. Introduction of a quality management system (QMS) with certification according to DIN EN ISO 9001:2000 and VDA 6 Part 4. 2002 Extension of a 900 m² production hall. Doubling of logistics for loads up to 50 t.
Capacity expansion of the machinery. 2003 Extension of further social rooms and the production area. Production area totalling now 1700 m², administration and production rooms totalling now 850 m². Design and manufacture of tool sets for GT presses. Commissioning of the first 5-axis-controlled universal milling machine (DMU 200 P). First-time apprenticeship of a cutting machine operator (milling technology / CNC technology). 2004 Exhibition at the Euroblech 2004 in Hanover. Migration from CATIA V4 to V5. Recertification according to DIN EN ISO 9001:2000 and VDA 6 Part 4. 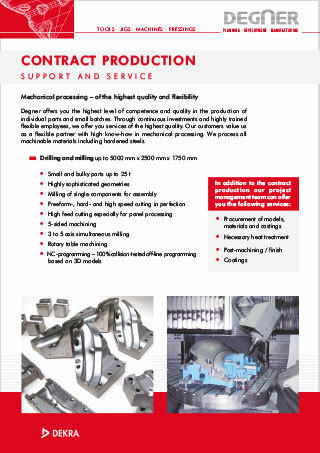 2005 Introduction of the PowerMILL 3D programming system from Delcam. Expansion of the range of services by contract manufacturing. 2006 Exhibition at the Euroblech 2006 in Hanover. 2007 Recertification according to DIN EN ISO 9001:2000. Extension of the measuring technology by a mobile measuring arm with a measuring length in the room up to 2400 mm. Expansion of the range of services by the "extended workbench". 2009 Development of a tool management system. Integration of a Zoller "Venturion" measuring and setting device for CNC production. 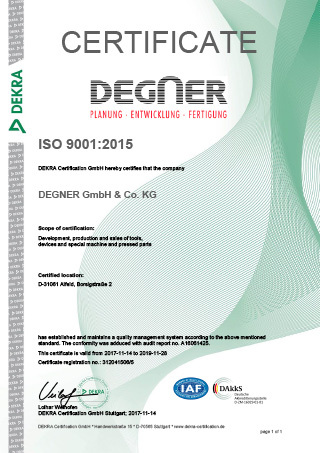 2010 Recertification according to the current DIN EN ISO 9001:2008. 2011 to 2014 Construction of a functional unit with four horizontal machining centres for individual and series parts. Introduction of the CAM system ESPRIT by DP Technology. 2015 Establishment of the "Research and Development" pilot plant for innovative solutions and confidential tasks. 2016 Extension of the production spectrum by a 5-axis universal machining centre. 2017 Conversion of the QM system and certification according to DIN EN ISO 9001:2015. 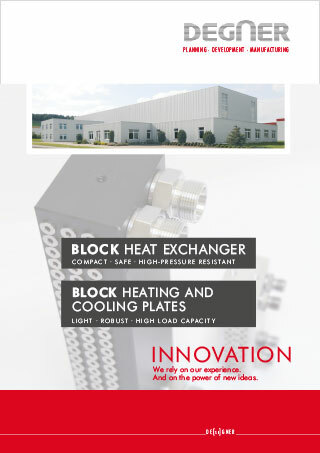 2018 Presentation of the BLOCK heat exchangers and the heating and cooling plates at the WTT-Expo 2018. Expansion of the production spectrum by a pallet storage system. with experience ideally in PowerMill or ESPRIT. Mori Seiki MAPPS IV controllers. machine, tool or mould construction. Training content: machining of workpieces, programming of numerically controlled machine tools and systems, assembly and commissioning of tools, devices, gauges, with the training goal of highly qualified skilled workers with career opportunities as technicians, programmers, and engineers. Training content: Creating, entering and optimising programmes, as well as manufacturing workpieces on numerically controlled machine tools, setting up milling machines, milling tools with the training goal of a highly qualified skilled worker with career opportunities, e.g. as a technician and programmer.